1. Add vest with groin area defence for the price of reduced movespeed? Dunno, was this idea discussed here, but anyways, almost everyone typed here about "gutshots" at least once. 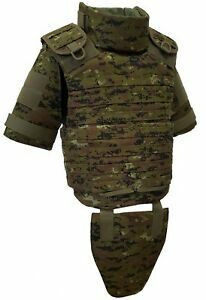 why don't devs add vest with defended groin area? Yes, it will require significant amount of work, but it will significantly reduce amount of "gutshots" in game. U may say, that it will impoverish gunplay, and I will agree with u, because u have to aim at guts to use the lack of armor there, but simultaneously gunfights will be more predictable and(don't know good it's or bad) there will be much less sniper-gutshots. 1) simple choice - vests with/without groin area defence. 2) for those, whose choice is defended groin, there should be penalty - even with HDPE vests and MPs their movespeed will be as if they are at least in "middleweight" load sector. I'm all for balance and fairness. I know, that some ppl can and will disagree with me, so here is the poll. Plz, vote. For me yours idea is awesome. More protection but lower mobility. Player have chance to choose what he want, protect more body parts, or less of them but be more faster on the battle field. -No, I need real protection! -You dont understand. I. Need. PRO-TEC-TION! @Atway 5 decades into the future and maybe we'll get the 4th and 5th kind of heavy battle suit. PS: I was imagining how in the world can a person get through a doorway equipped with an armor of that size... Might leave some scratches on the armor and cracks on the doorway? For last few days I was screening almost all of my deathscreens with bullethits counts. Of course deaths that were caused by handheld weapons. Here are screenshots with various weapons dmg. Beryl, Ak-15, G36, G38, Vepr, MSBS-B and Vityaz. As u can see, usually it-s 4-5BTK. Exception are 7.62 AK-family rifles. Usually bullet shot and bullet hit count is 1.5-2. So it's 0.5-0.7 secs TTD if u are staying in open. I posted in 0.4Update Feedback theme my thoughts, that hands are usually covering upper half of armor vest. Now look at screenshots one more time and compare hand-hits to the vest-hits. At best it's 1to1, usually there are more hits in the hands then in the vests. Best example is screen with MSBS-B. I made more than 110 screenshots and that's how it looks like. For ~110 deaths there are ~70 vest hits, and ~195 gutshots and hand-hits(both WZ and TDM). Current hit ratio shows that vests protection ability is low. And it doesn't rly matter, what type of vest u r wearing. 6 of 7 bullets will hit undefended areas. Currently, the more precise weapon u have - the more is the chance for u to hit armor. All in all, I like current gameplay and gunplay of WW3. But knowing that I don't need to aim to chest on high ranges and the result be almost the same, just don't let enemy's silhouette leave the crosshair, it's kinda disappointing. Mediocre aiming is enough. So, obviously, current realization makes WW3 forgiving in terms of gunplay and aiming, that is kinda good for wide masses as it's lovering the treshold of entering the firefights. We mustn't forget that for WW3 is not a "load and go" game. If after almost hour, that's needed for new player to customize his loadouts, etc. after all the time he spent to get a sense it'll be unfair after all that add also a complex hit'n'reg mechanics. For us... who've played hundreds of hours it makes game a little unchallenging, and now positioning and use of the gadgets is more important than good aim, because as I said, ppl's ability to keep silhouette in crosshair from some point doesn't differ that much. Me, personally, would like to see soldiers with vests that are like on the pic below. But I don't know how it can be balanced since everybody will start to shoot enemies in the legs. Yay! Now I don't need to run in open just to let ppl shoot me! But I don't know how it can be balanced since everybody will start to shoot enemies in the legs.